Complete guide of how to watch NFL on Kodi – Includes a Kodi setup guide, a list with the best NFL Kodi addons and instructions to install the kodi addons. If you’ve cut the cord already or are thinking of doing so, you’re probably wondering how you gain access to the sport you love and at this time of the year that’s probably the NFL. After all, you can’t win your fantasy football league if you can’t watch the game right? For those International fans, it’s actually even worse as even if you wanted to pay your cable company for the games, they simply do not have the rights to the content and while the NFL App is great, it doesn’t stream live games which is what we all want to see! I probably don’t need to tell you about Kodi on this site! After all, you would not be here if you didn’t already know something about it! However, what you might not know is which third-party addons are the best ones to watch the NFL on Kodi, where you get them and how you set them up. Well, stay tuned – ‘cause that’s what I’m here to help you with! There have been significant crackdowns over the last few months on illegal streaming. This is due to the ISPs (internet service providers) blocking their customers (you) to access that streams, causing Kodi errors, streams not opening or constantly pausing. Luckily there is a solution. If you use a good VPN, your traffic will be anonymous and encrypted so your ISP won’t be able to see what you are doing online. My VPN of trust is IPVanish, they have the fastest connections and also a very strict no logs policy, which means your traffic history won’t be stored so it can’t be used against you. Click this link for a 57% discount EXCLUSIVE to our visitors. Available for a limited time only. Just in case you’ve only heard about Kodi, but don’t have it setup or installed, here are some links to get you started. One thing, installing Kodi can seem like a complex operation. Don’t worry, it really isn’t. It’s very easy to get it setup and configured – just make sure that you follow each step carefully. If you’ve already got Kodi installed, please skip ahead to Step Two. You’ve probably heard about VPNs and why you absolutely need to have them when streaming content? Truth be told, all of those other sites are right! A VPN is a key requirement in protecting your privacy when online. Explained very simply, VPNs work by creating a tunnel between you and the content you are viewing. If you’re outside this tunnel, looking in, all you’ll see is the wall & you won’t even know what’s being transferred. However, another feature of VPNs that is not always mentioned is their ability to change your IP address. This basically means that the computer or server you’re connecting to thinks that you are local and in an area where it is “allowed” to send the content. Simply put, if you want to watch American Netflix, you need a VPN that tells Netflix you are in the USA. If you want access to BBC iPlayer, you want a VPN that will the BBC servers that you are in the UK and if you are an International fan of the NFL, you really need a VPN! We’ve tested quite a few VPNs over the years and the current king of the hill for us IPVanish. It’s got servers all over the world and is supremely fast (which is really important when using a VPN). We’ve arranged an EXCLUSIVE deal with IPVanish to give our readers 57% discount. Just follow this link. In most cases, the installation of the add-on itself is very similar (I’ll let you know if it varies at all), so once you know how to install one, you’ll have a good idea how to install the rest of them. Go to System Setting > Add-Ons and check the option that allows you to install from unknown sources. This is very important and needs to be configured otherwise some of the Addons in this list will not install. There are two parts to installing an add-on in Kodi. Step One is finding a repository (where the files are located) and installing the Go back to the System menu and navigate to File Manager. Select Add Source by double-clicking on the option. The second part of installing the add-on is … surprise … installing the add-on! See, I told you it’s not that hard! Once you’ve given your repository an appropriate name in #4, you need to go back to Kodi’s main screen and select the Addons This is an icon that looks like an open box. Select install from zip file from the list of options and navigate to that same repository we named in #4. Double click on it and wait until it finishes installing. Return back to the previous screen and select install from repository and then select the appropriate add-on based on the information below. Double click on it to install it and you’re pretty much good-to-go! 4. What are the best NFL Kodi Addons? 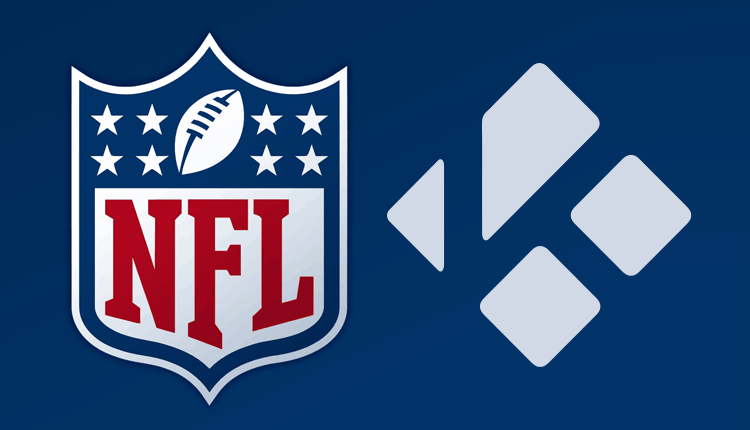 There are actually quite a few different ways of accessing the NFL on Kodi so I’ll split this part up into a couple of different sections to simplify things for you. This is the official NFL app. It has a host of video highlights but is not really useful for live streaming of games. However, true fans will love some of the curated videos that are available. Follow these simple steps to get it installed. Similar to the NFL.com add-on, this one does not offer live streaming. It does have information about specific teams and again is very useful for the true fans. Supremely easy to install, Game Pass can be setup directly from the home screen. You do need to have a Game Pass account, but with it you gain access to a host of official NFL streams. Follow these simple steps to get it enabled. Navigate to the home screen and select Add-ons. You’ll need the Eracknaphobia repo file for this one, so make sure you’ve downloaded it. See the instructions above for the link and information on how to add it to your repo’s. From the home screen select Add-ons and select, Install from zip file. Open the Eraacknaphobia zip file that you’ve saved and select eracknaphobia.zip. Click on install from repository. Select install from repository and select eracknaphobia’s repo. Select Video Add-Ons and then choose NBC Sports Live Extra Legacy. Select install and wait for the Add-on enabled message. Once it’s installed, you can access it in the Video Add-Ons section, but you will need to configure it first so select configure and enter the information required. You’ll need the XLordKX repo file for this one, so make sure you’ve downloaded it. See the instructions above for the link and information on how to add it to your repo’s. From the home screen select Add-ons and select, Install from zip file. Open the XLordKX zip file that you’ve saved and select the xlordx It should be labeled repository.xlordx-1.0.0.zip. Click on install from repository. You will need your user id and password & dependent on your region, you might need to enable a VPN for the geolocation functionality as Prime Instant Video is not available globally. Make sure you use the Fusion repo here. If you’ve not already installed it, follow these simple instructions to get it enabled, otherwise jump to the next step. From System > File Manager, select Add Source and click on the <None> Type the following – http://fusion.tvaddons.co and select Done. Enter fusion in the name field and select OK.
From your Home Screen, select System > Add-Ons > Install from Zip file and choose fusion. Select Kodi-repos >English and then select xbmchub-x.x.x.zip and wait for the Add-On enabled notification. Select install from repository and then choose the TVADDONS.ag Addon Repository. Navigate to Video Add-ons and select USTVnow Plus. Now just wait for the add-on enabled notification. You will need your user id and password & dependent on your region, you might need to enable a VPN for the geolocation functionality if you are outside US. To read how to use the VPN jump back to step 2 -> Protecting Yourself. The Kodi addons below have proven to be reliable sources for streaming sports, NFL content, movies, and other videos. Channel PEAR is a collaborative, cloud-based media library (something like PLEX on steroids) that can be viewed on a variety of different devices. It is limited to five channels for free, or you can upgrade to a premium service directly with Channel PEAR. Channel is also available from the Fusion repo (we talked about that one with USTVNow Plus), so if you’ve already installed it, just skip ahead. If you’ve not already installed it, follow these simple instructions to get it enabled, otherwise jump to the next step. From System > File Manager, select Add Source and click on the <None> Type the following – http://fusion.tvaddons.co and select Done. Enter fusion in the name field and select OK. Select Kodi-repos >English and then select podgod-x.x.zip and wait for the Add-On enabled notification. Select install from repository and then choose podgod repo and select Video Addons. Click Channel PEAR and select Install. Now just wait for the add-on enabled notification. Once upon a time, there was an excellent add-on called Phoenix, that, unfortunately, went the way of the dodo. Fortunately, it has been reborn as Bennu. With Bennu you have access to a host of popular US & UK channels, including lots of sports! You do need to also install the YouTube add-on and the Colossus Repo so make sure you take care of that too. If you’ve already installed the Ares Project Repo (which includes Colossus & Bennu skip ahead), otherwise From System > File Manager, select Add Source and click on the <None> Type the following – http://ares-repo.eu and select Done. Enter ares in the name field and select OK.
From your Home Screen, select System > Add-Ons > Install from Zip file and choose ares. Select aresproject-0.1.0.zip and wait for the Add-On enabled notification. Select install from repository and then choose Ares Project and select Add-on repository. Select Colossus Repository and Install. Now just wait for the add-on enabled notification. Go back two steps to the Install from Repository and select Colossus Repository > Video Add-ons > Bennu and click Install. Now just wait for the add-on enabled notification. I know I’ve given you a lot of information here – perhaps too much – but it might help if you know how I’ve setup my system, as I’ve been very selective in my choices! I don’t actually have any of the official NFL kodi addons setup. I do however have Prime Video so I get access to those games already. For my other games, I’ve been extremely happy with USTVnow and Made in Canada IPTV Kodi addons. Those two get me the bulk of the games I’m interested in and for other games, I’ve missed, I have quite a bit of success with Bennu. Bear in mind that if you are outside US you need a VPN to for example use USTVnow or Made in Canada IPTV as they only work for people located in USA/Canada. So with a VPN you can choose to connect to USA and use an US IP address. Changing locations with a VPN is as simple as 1 click! If you want to know more about using the VPN to access the recommended NFL addons, jump back to step 2 -> Protecting Yourself. If you are ready to use a VPN, we’ve arranged an EXCLUSIVE deal with IPVanish to give our readers 57% discount. Just click on this link. As you can see, there is not always a one-size fits all approach that will work. However, the great thing about Kodi is you experiment to your heart’s content, trying out different configurations and you do not have to worry about getting locked into a contract with a cable company! It’s a win-win! Why many streams on Exodus, Covenant, Elysium and Specto don’t open?